Vizio, best known for manufacturing HDTVs, is a relative newcomer to the PC business. It’s been producing slim, minimalist laptops and all-in-one desktops for about 18 months. The Vizio CT15T-B1 is the latest iteration of the company’s 15.6-inch “Thin + Light” laptop, and its main selling point is a glossy HD touchscreen. The CT15T-B1, which costs $1470 as of this writing, maintains the signature look of Vizio laptops: It has a smooth, gunmetal-gray metallic cover with neatly beveled edges, a spacious keyboard deck, and an edge-to-edge glass screen. In fact, Vizio hasn’t really updated its design at all from the CT15-A4. Because it’s what’s on the inside that counts, right? Minor issues we’ve seen in the past are still here. Well, what’s on the inside of the CT15T-B1 is a little disappointing, since it was released before the launch of Intel’s fourth-generation Core (aka Haswell) processor. The CT15T-B1 sports a quad-core Intel i7-3635QM processor from the Ivy Bridge line, along with 8GB of DDR3/1600 memory and a 256GB SSD. It doesn’t disappoint when it comes to performance, though: With a Notebook Worldbench 8.1 score of 334, this is one of the speedier laptops we’ve tested. It’s a little more than three times faster than our Core i5–powered reference notebook. If you’re looking for a laptop that will perform various tasks quickly and efficiently, the CT15T-B1 is a good choice. One caveat: This machine doesn’t have a discrete graphics card, so its graphics performance is mediocre at best. In our Bioshock Infinite test (low resolution/low quality settings), it managed just 24.2 frames per second, nowhere near the 79.7 fps of the ultrafast Cyberpower FangBook EVO HX7-200. Apart from gaming performance, the CT15T-B1 is a good buy with some minor design issues. The main attraction—its touchscreen—looks great. The 15.6-inch IPS (in-plane switching) display has a native resolution of 1920 by 1080 pixels. Colors are bright and accurate, text is crisp and clear, and the touchscreen is responsive and easy to use with smooth multitouch gestures. It’s not the best touchscreen I’ve tried—I did notice some minor snags and lags during my testing—but it’s pretty high up there. Multimedia on the CT15T-B1 looks and sounds good, but not great, which is disappointing considering Vizio’s expertise in building HDTVs. Streaming HD video plays smoothly and with minimal artifacting and noise, but audio is another story. The speakers, located above the keyboard, aren’t the worst speakers I’ve heard on a laptop (that distinction belongs to Micro Express’s line of terrible-sounding laptops), but they’re not very good. Sound is fuzzy, a little distorted (even at lower levels), and generally difficult to listen to. These speakers will do in a pinch, but I don’t recommend using them if you don’t have to. Since Vizio hasn’t updated its design, minor issues we’ve seen in the past are still here. For example: This laptop has very few ports, even though it’s large and not really an Ultrabook. The left side houses a USB 3.0 port and a combo mic/headphone jack, while the right side houses another USB 3.0 port and an HDMI port. You'll find no ethernet jack, nor a Kensington lock slot, an eSATA port, or anything cool. I understand that this is a “Thin + Light” laptop (frankly, it’s not all that light—it weighs almost 5 pounds without the power brick), but most of the little 14-inch Ultrabooks I’ve seen have at least three USB ports. Vizio carried over most of the design elements from its first Thin + Light notebook. 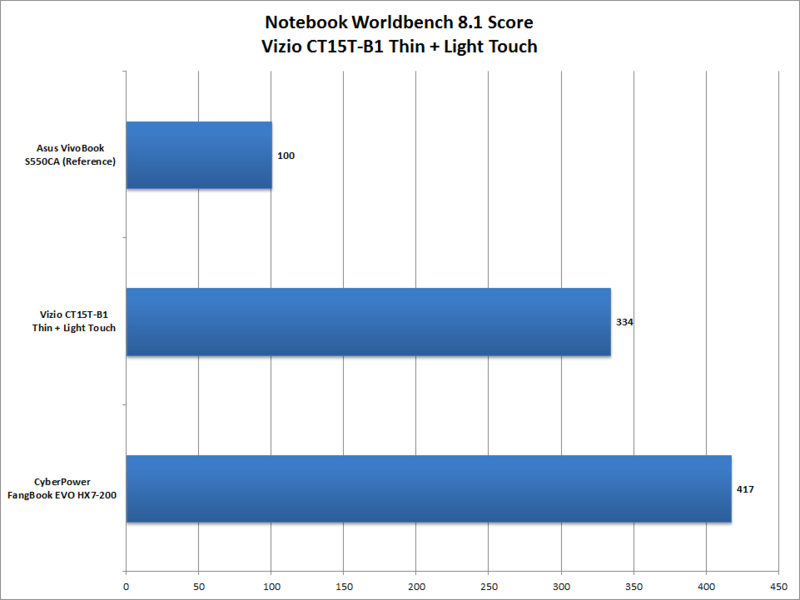 While it’s disappointing to see that Vizio hasn’t fixed such minor annoyances—fixes that could make a good product great—the CT15T-B1 remains a good laptop if you’re looking for a slim and (relatively) light high-performance machine. It’s speedy, even though it doesn’t have a Haswell processor, and it has a nice, bright touchscreen for all your Windows 8 needs. We'd like this machine a lot more if Vizio made a few design tweaks and shaved some weight to render this good notebook great.